Touted has being one of the biggest beach resort cities on Mexico’s Pacific coast, it has two five-mile stretches of beach on two bays that are separated by a peninsula. One of the nicest beaches is at Las Brisas, located in the Bay of Manzanillo. This is a residential area with condominium complexes. It is situated next to a naval base. There are many activities to keep you busy as a retiree, some of these include: sport fishing, golf (there are five golf courses in the area), hiking, horseback riding, boating, swimming, surfing, scuba diving, and snorkeling. it also has several spas and gyms for indoor workouts. 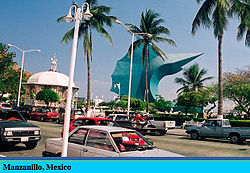 Manzanillo is located in the state of Colima. Set in Bahia de Santiago, the Bay of Good Hope, it boasts one of the world’s best climates, the lowest crime rate in all of Mexico, world class fishing, whale watching, bird watching, world class golfing, gorgeous beaches, and an opportunity to live in a world class community. This town began as a port city in 1873. Banana, coconut, coffee and organic salt plantations are located here in the region. It has a population of 130,000, and with the city spread across two beautiful bays, it holds the small town charm that makes it a magical place to retire in a peaceful and tranquil setting. This city has all of the necessities you would expect, such as first class hospitals, affordable healthcare, international airport, shopping centers, churches, theaters, public transportation, high speed internet services, and affordable living costs. Real estate, even for beachfront property, remains surprisingly affordable. Once you get away from the first-line beach, property prices begin to drop and can be dramatically lower even a few blocks inland. Single-family homes are more affordable and more available. Many of the gated communities fall into this category and offer sea views. You can acquire a single-family house in a gated community from $150,000 to $200,000. In addition, many small subdivisions are being built on the inland side that have such amenities as small parks and pools in the public areas. Small two- and three-bedroom modern houses in these subdivisions sell for anywhere from $55,000 to $100,000 each, with many falling in the $60,000 to $80,000 range. Houses at this price and in this area can command monthly rents in the $800 to $900 range. Retiring to Manzanillo will afford you a warm climate, attractive beaches, friendly people, a myriad of restaurants, and affordable housing makes this small city your Ideal Place to Retire. Find Other Cities in Mexico!